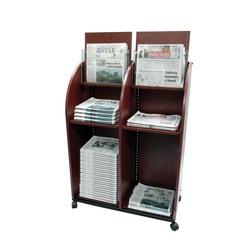 This double newspaper display allows you to present two different newspaper side-by-side. Efficient design holds one of each newspaper vertically for public view, a small stack of papers within easy reach of customers and a large area to store bulk excess. Casters make the unit simple to move.